The ability to create custom tiles in your Office 365 tenancy has just been pushed to a much wider audience as of July 22. In Office 365, you can quickly and easily get to your email, calendars, documents, and apps using the Office 365 app launcher (learn more). The tiles in the app launcher are those that have been promoted, or pinned, from the My apps Page (learn more). The My apps page includes all of the apps you get with Office 365 as well as custom apps that you add from the SharePoint Store or Azure AD. 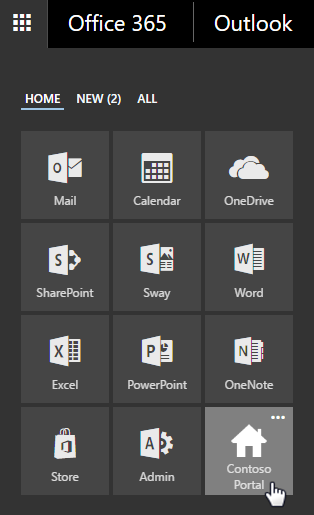 In addition to these, you can add your own custom tiles to the My apps page that point to SharePoint sites, external sites, legacy apps, and more. Once there, you can pin them to your app launcher and instruct your users to do the same. This makes it easy to find the relevant sites, apps, and resources to do your job. 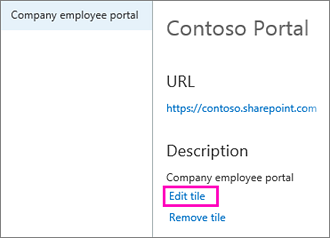 In the below example, a custom tile called “Contoso Portal” is used to access an organization’s primary SharePoint site. Tip To perform these steps, you must be an administrator with access to the Office 365 admin center. Select the app launcher icon and choose Admin. Choose Company Profile in the left navigation. Choose to create a new custom tile. This opens the Add or edit a custom tile window. Enter a Tile name for the new tile. The name will appear in the tile. Enter a URL for the tile. This is the location where you want your users to go when they select the tile. Enter a Description for the tile. You see this when you select the tile on the My apps page and choose App details. Enter an Image URL for the tile. The image appears on the My apps page and app launcher. Tip The image should be 50×50 pixels, stored in SharePoint Online, and shared with everyone. You can, for example, put it in a library on your team site then generate an anonymous guest link and use that as the URL. If you can’t generate an anonymous link, make sure external sharing is enabled in SharePoint Online. Choose Submit to create the custom tile. Your custom tile now appears on the My apps page for you and your users.. Select the app launcher icon and choose My apps. Select the ellipsis and choose Pin to app launcher. Important Both you and your users need to perform these steps to promote custom tiles from the My apps page to the app launcher. 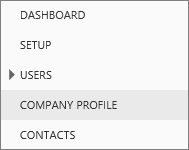 In the Office 365 admin center, choose Company Profile in the left navigation. Select a custom tile and choose Edit tile. 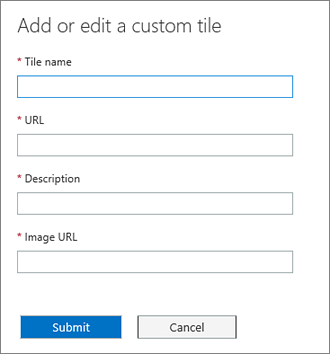 Update the Tile name, URL, Description, or Image URL for the custom tile (see earlier description). To delete a custom tile, follow steps 1-3, choose Remove tile and then Delete. In addition to adding tiles to the app launcher, you can add app launcher tiles to the Office 365 navigation bar (learn more). To customize the look and feel of Office 365 to match your organization’s brand, see Customize the Office 365 theme. RSS blog feed missing items in Office 365 SharePoint Online?